If you have ever had the pleasure of using the Freemax tanks, you are going to be all too familiar with their state of the art features and ability to flawlessly recreate flavors and cloud production so that your vaping sessions are remarkable. This pack of replacement coils is going to make sure that your Fireluke tank can keep on giving you that advanced performance that you have come to expect without any hitches in the road. They are so easy to install that after a couple of times, you might even feel confident enough to be able to do it with your eyes closed. Your juices are going to thank you for giving them the chance to truly shine and stand out which will make it so that you can really make the most of them and get your monies worth. You can forget about those dry, less than satisfying hits of the past and move on to bigger and better things with this five-pack of replacement coils that are going to keep you happily vaping in the long run. These coils come in a Mesh 0.15ohm, Kanthal Triple Mesh 0.15ohm, Kanthal 0.2ohm and SS316L Single Mesh 0.12ohm versions that all use organic cotton for wicking. 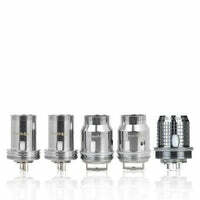 When you invest in these coils, you will be setting yourself up for vaping experiences that can only be described as unforgettable.